The Richmond was host to some serious R & R earlier this month! Buddha Brands Co. Launched their brand new flavour for their Thirsty Buddha coconut water...WATERMELON, as if it wasn’t already delicious enough! Buddha Brands Co. incorporated a modern, relaxing vibe in their launch by featuring an hour-long yoga class with signature mats and oodles of their new product for guests to enjoy. The event commenced underneath the pops of bright melon colors and accents while guests reenergized over fresh farmer’s market salads and Thirsty Buddha beverages. Buddha Brands Co. Really knows how to introduce a product to the market by not only inviting their nearest and dearest, but also by inviting viewers from all over the country! CBC Dragon’s Den captured this innovative introduction here at The Richmond! 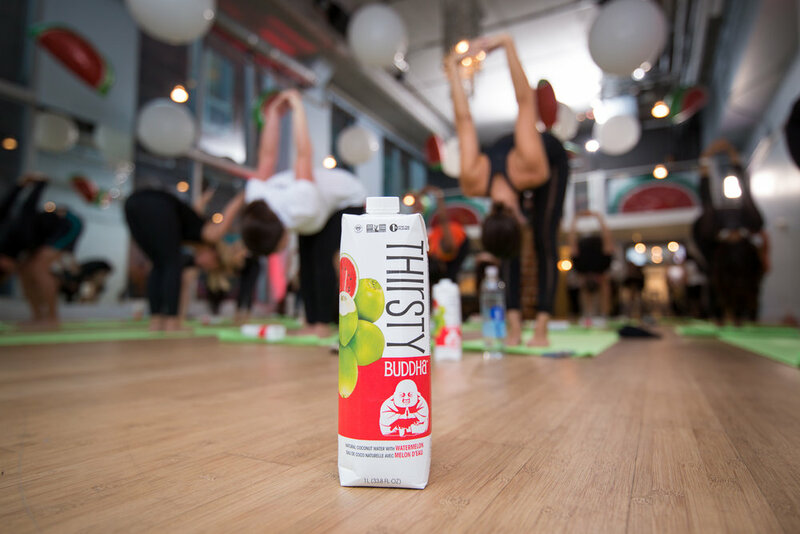 With the CBC film crew intact, the yoga mats in position, and the refreshing new product ready for sipping, Buddha Brands Co. Achieved the perfect launch of their new flavor!